I can't select an optional paper cassette as my paper source. What should I do? Turn the product off and on, then follow the instructions below for your operating system. You need to enable the optional paper cassette unit before you can use it with the printer software. 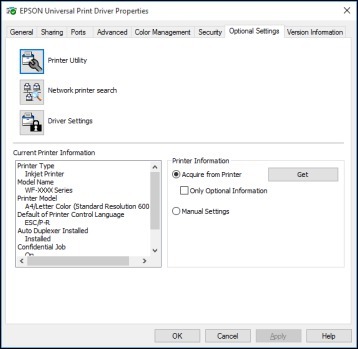 Note: If you are using the Epson Universal Print Driver or PostScript (PS3) printer software, see the link below to enable the optional cassette unit. Windows 10: Click and select (Settings) > Devices > Printers & scanners. Select your product name and select Manage > Printer properties. Windows 8.x: Navigate to the Apps screen and select Control Panel > Hardware and Sound > Devices and Printers. Right-click your product name and select Printer properties. Windows 7: Click and select Devices and Printers. Right-click your printer name and select Printer properties. Windows Vista: Click and select Control Panel. Click Printer under Hardware and Sound, then right-click your printer name and select Properties. Make sure Acquire from Printer is selected, then click Get. 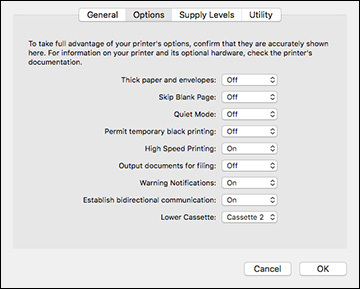 The optional paper sources are listed in the Current Printer Information section. The optional paper cassette is now enabled. Note: If you are using the PostScript (PS3) printer software, see the link below to enable the optional cassette unit. Select the optional cassette unit you installed as the Lower Cassette setting.